Thanks everyone for an awesome meeting last night. There are two events happening this weekend that we wanted to let you know about. Thing 1: Our own Susan Teece is one of the featured artists in the Sidney Fine Art Show. It runs today through Sunday, the 17th - 19th. Information is HERE. 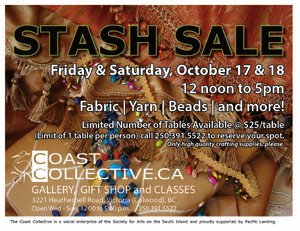 Thing 2: Coast Collective is having their first ever STASH SALE! Today and tomorrow only, the 17th - 18th, 12pm - 5pm both days. Information is HERE.